Maximize the value of your internet connection. Combine access services — from us or any other provider — and we’ll optimize your network to take advantage of each connection. In the event of service interruption, fail over while maintaining the same IP. Boost the speed and reliability of your broadband and add no loss Failover by bonding multiple services. 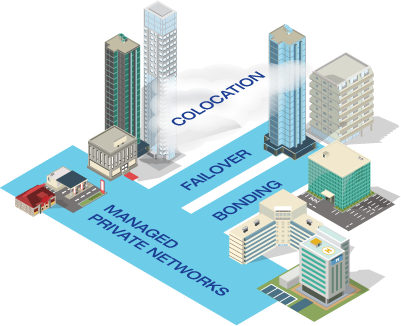 Work with our networking experts to design a managed Private Network, with the option to move your servers to the cloud in one of three Skyway Colocation facilities. Order two different Internet access services and fail over from one to the other. Separate your traffic to take advantage of the bandwidth and attributes of each service. Unlike other solutions, Skyway delivers both inbound and outbound Failover.